Get all the toys in the house to the one area (lounge, front lawn: any large space). Put like items in a group/box/tub (It’s amazing how a natural flow starts to happen as you start this sorting process. Missing pieces of a puzzle turn up, all the Shopkins start to surface and all the bits of Lego find their way together again). Throw out any broken items, or toys with missing pieces. Pick up each toy and make a conscious decision if you are going to keep the item or not. Keepsakes – beware the temptation to hang onto keepsakes! Take a photo, make a video with the child, but don’t put it in a box for prosperity. If you love it, find a way to keep it and put it on display. Set up a box for “donate”, “throw out”, “give to other” to continue decluttering, (Note: you don’t want to be burdening others with your stuff so make sure that “give to other” items are in perfect condition and that the person will definitely want the item). 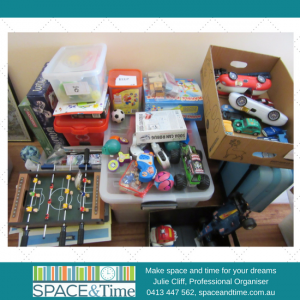 Now that you have sorted the toys and have a small collection to keep we can consider storage options. Storage options should suit your budget, easy to use and easy to repeat. Revisit steps 1 – 9 periodically to keep on top of the clutter. If you need a hand decluttering check out my decluttering services or Contact me today for a chat about how small changes to your planning can make a big difference to the stuff that is around you.